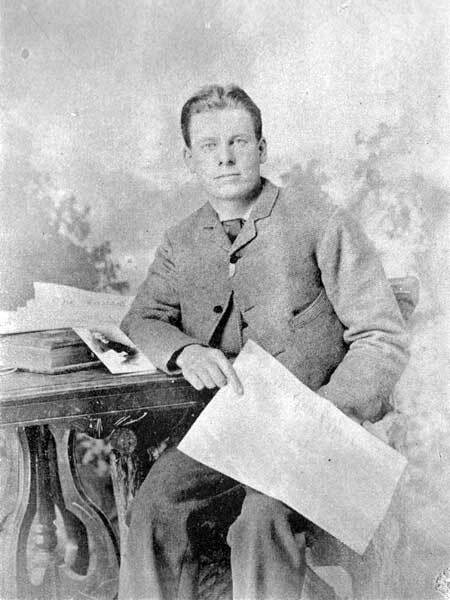 Born at Bristol, England on 29 January 1858, son of Thomas Henry Waite Hall and Sarah Burrow Jones, he was educated in the Bristol Grammar School, and came to Canada in the summer of 1882, settling at Portage la Prairie. In the winter of 1883, he began working at the Portage la Prairie Review, and subsequently at the Marquette Liberal. In June 1885, he established the Virden Advance for C. J. Atkinson of the Liberal and, in April 1889, he became its proprietor and editor, expanding it several times. In February 1896, he moved to Wolseley, North West Territories [now Saskatchewan] where he was editor of the Wolseley News until his death. On 25 May 1887, he married Jane Bulloch (1868-1944) of Reston. They had ten children: Jeanette Mabel Hall (1888-? ), Charles Leslie Hall (1889-? ), Lillian Ruth Hall (1890-? ), Ralph Victor Hall (1892-? ), Thomas Wilfred Hall (1894-? ), Pheba C. Hall (1900-? ), Sarah Hall (1901-? ), Ellen Hall (1901-? ), Sidney Hall (1904-? ), and Walter Hall (1906-?). He was a member of the Baptist Church, Orange Lodge, Black Knights of Ireland, and Royal Templars of Temperance. He died of heart failure at Wolseley, Saskatchewan on 5 December 1906. “Wolseley editor dead,” Winnipeg Tribune, 5 December 1906, page 1. “Wolseley editor dead,” Manitoba Free Press, 7 December 1906, page 4. We thank Neville Casey and Gail Hicks for providing additional information used here.